The Blue Star Program is an SMC-branded network of community level non-graduate health providers who are trained on family planning, reproductive and child health and nutrition with other public health priority areas to offer quality services to the beneficiaries. The vision of Blue Star program is to create a network of skilled community level non-graduate health providers who will offer a wide range of public health services, products and emergency referrals to improve health, family planning and nutrition status of the community. The program started in 1998 and it currently has 7,000 providers. 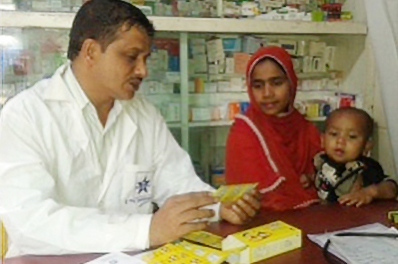 The program is being implemented in collaboration with the Directorate General of Family Planning (DGFP) of Bangladesh with the financial assistance from USAID. Blue Star providers are selected based on certain criteria that include a minimum SSC level education, having a licensed drug store (drug license/PCB registration, etc. ), at least three years of practicing experience, adequate female and child client flow and have willingness to attend training programs and to adhere to the standard service protocol suggested by SMC. After selection, the providers receive three days basic training and refresher training at regular intervals. The basic training is jointly organized by DGFP and SMC and successful participants receive a certificate. The basic training curriculum includes family planning methods with special focus on Injectables, referral for Long Acting and Permanent Method, counseling skills, healthy timing and spacing of pregnancy, maternal health (which include antenatal care and safe delivery), postnatal care, essential newborn care, integrated management of childhood illness focusing on ARI/pneumonia, diarrhoea, tuberculosis, child nutrition, record keeping and reporting. Periodical newsletter “ALAAP” is also distributed among the BSPs to update their knowledge on various technical areas as well as sharing best practices. An injectable contraceptive named ”Depo-Provera”, over-branded by SMC as SOMA-JECT, is being offered by the BSPs. SMC also introduced SAYANA PRESS, a subcutaneous DMPA injectable contraceptive, through this network from 2013. They also refer suspected TB cases, potential LAPM clients and severely sick mother and children to the nearest service delivery points. 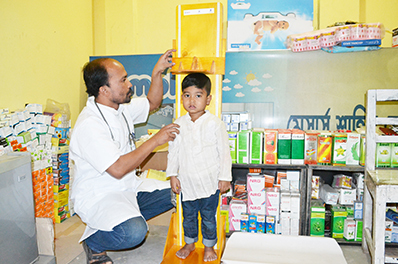 In addition, they provide nutritional counseling and services for under-5 children and offer them MoniMix to address Iron Deficiency Anemia (IDA). Recently, SMC introduced Growth Monitoring and Promotion services and Nebulization services for the under-five children from the selected BSPs. In 2016, SMC introduced Blue Star Electronic Reporting System (BSERS), a mobile and interactive voice response (IVR) technology based electronic reporting system for the Blue Star providers. About 95% of the providers are sending their monthly performance and stock reports directly to SMC using this platform easily without any charge from their end. SMC promotes Blue Star outlets and the network through comprehensive demand creation activities using both the local and mass media. 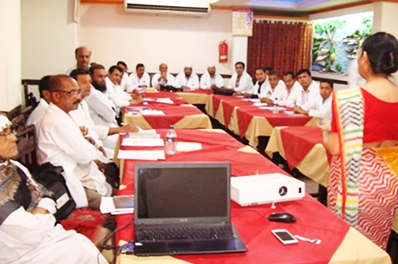 SMC organizes regional workshops in each year to create a learning opportunity from each other and improve performance through recognition and motivation. Currently, 36 Program Officers-Training and Service Delivery are closely supervising the Blue Star program and provide on-site technical assistance to the providers to ensure quality of care and services across the country.